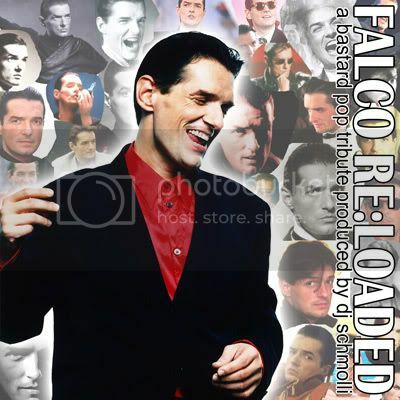 Falco Reloaded: "Falco re:loaded" - the album! "Falco re:loaded" - the album! So here it is finally. My tribute to the biggest pop superstar Austria ever had. When Falco died in a car accident 10 years ago he left a big and never to be filled hole, R.I.P. Johann Hölzel. Get more information on the tracks and a 192 kbps single track download HERE. To help us saving bandwidth I'd recommend to get the whole album zipped in 320 kbps incl. artwork HERE (Megaupload), HERE (Sendspace) or HERE (Uploaded). Or grab the torrent HERE. Please see this album as my way to honour Falco, also I'd like you to support all artists I've used! An absolutely "must have"; not only for Falco fans but for all lovers of great mixing work! Nice job on these mash-ups. "Do It Again" was always one of my favorite Falco 12" remixes. Great to hear it used on this project. Props! Yeah, das fezt. Danke für ein tolles Mashup Album. Ich hörs mir immerwieder gern an.